View More In Apple Cider. 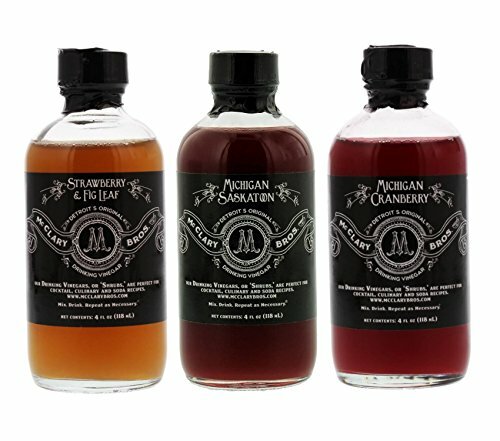 The McClary Bros. Three Bottle Drinking Vinegar Sampler Pack is the perfect mixer for your favorite spirit cocktails.This set includes (1) 4oz bottle of McClary Bros. Strawberry Fig & Leaf, (1) 4oz bottle of McClary Bros Michigan Saskatoon and (1) 4oz Michigan Cranberry Drinking Vinegars. Strawberry Fig Leaf is perfect for drizzling over your favorite salad or add it to your lemonade for an instant kick! Michigan Saskatoon gives the flavor and look of a berry & is similar to that of a blueberry and we're excited to be able to shine a spotlight on this beautiful, cold climate berry. Michigan Cranberry will take your classic "Vodka Cranberry" to a new level. McClary Bros was able to source these cranberries from Michigan growers and it is in short supply this year. Michigan Basil provides you a balance pure & authentic Michigan grown basil. If you have any questions about this product by McClary Bros., contact us by completing and submitting the form below. If you are looking for a specif part number, please include it with your message.